As shown in this brief tutorial video the instructions and physical process of replacing Solaire burners is very simple and safe in all models. In this video we’re showing the removal and installation of a convection heat U burner and an infrared burner in Solaire barbecue grill models. Although the sizes of the burners are obviously different, the actual installation and removal processes are the same. Solaire Burners and all other parts for grill repair. As we have seen above, Solaire barbecue grill burners are easily removed and installed. Working on gas appliances a couple of decades, I can assure you most repairs are not so simple. Solaire gas grills are not only extraordinarily effective grills, versatile for all kinds of different types of cooking but very simple to repair when necessary. usually we can only see this inside firewall when installing this infrared burner. When removing the Solaire burner we lift the burner from the back and as we are raising the back of the burner we slide the burner away from us. 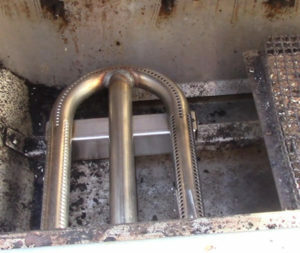 Slide the burner towards the back of the grill so the front venturi tube slides off the control valve we cannot see until the tube is completely free from this front wall. This completely removes the burner from the grill. No screwdrivers or wrenches, no bolts covered in the last 10 years of cooking, no rusted brackets to remove, Simple and Safe! Towards the lower right side of the picture notice the ignition electrode bolted to the wall so the steel ignition rods extend out over the burner. 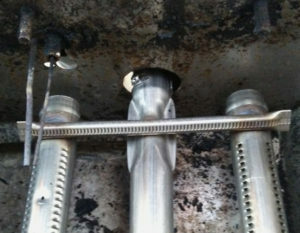 The ignitor electrode does not need to be removed to access or slide out the burner or install the new burner. Seeing more of the wall when installing the U burner does not help. Note the groove on the left side of the image allows the ignitor to move up and down. 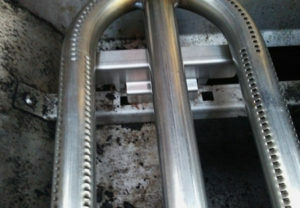 This image shows the same basic angle as above but obviously the U shaped burner. Removing the U burner is exactly the same process of lifting the burner from the back and sliding the burner towards the back of the grill until the center feed tube is off the valve and slides out of this front wall. Grill parts for Solaire models 30 and larger. When we install the new burner this process is reversed. Insert the front venturi tube through this round hole in the front firewall and slide the tube over the tip of the control valve. We cannot see the burner tube slide over the orifice at the end of the valve so we slightly wiggle the burner as we are sliding the center tube over the valve. Once the small round opening is over the valve we will feel this because the burner will not longer be able to wiggle back and forth once the orifice is inside the small opening in the burner tube. This center venturi tube has an air shutter at the tip where the burner slides over the valve and the air shutter will usually need to be adjusted when a new U burner is installed. When we receive a new burner, there is no way for the air adjustment shutter to be pre-set to match our area, fuel type or fuel pressure. This air shutter is essentially a carburetor designed to allow fuel to mix with oxygen as fuel flows into the burner. Inside the back of the grill both the infrared and U burner have a channel to attach to the back support. This image shows inside the grill, just inside the back wall where there is a support beam installed to support both infrared and u burners. Both burner types have a bracket like an upside down “U” to fit on top of this bar. This keeps the burner from moving front and back or left and right inside the grill and makes the burner installation very safe. 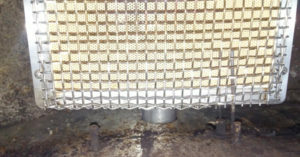 With the bracket in place, the front of the burner — which is installed over the orifice at the tip of the gas valve — cannot move at all. Smaller Solaire gas BBQ grill models have a slightly different back support locking design but the effect is the same. The infrared burner and the U burner in the various smaller Solaire grill sizes have a support bar with small cut-out openings for the burner bracket to drop into which ensures the burner is unable to move inside the grill. Grill Repair parts for Solaire 27 models. solaire infrared grill — install burner over orifice at valve next to ignitor electrode which adjusts up and down for efficient ignition with any burner. 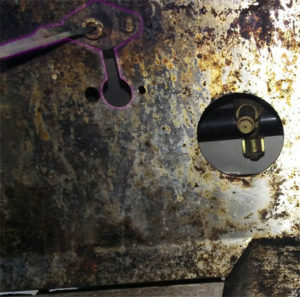 Once the burner installation is completed, check the electrode highlighted purple in this picture. The electrode is more effective in the higher position when an infrared burner is installed and the electrode is moved to the lower position when a U burner is installed. This allows the electrode to place the ignition spark exactly where the fuel will first flow from the burner so ignition is immediate and safe. 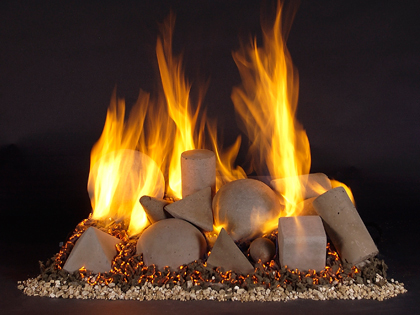 When installing a new burner there are other considerations after the burner is installed. Always check ignition for safety because gas flows from the burners when the valves are turned on regardless of whether the ignitors are working or broken and gas flowing without ignition can be very dangerous, even fatal. Also check the flames and heat of the new burner. Infrared burners will need a couple minutes to pressurize and will look like the top of the burner is glowing orange. Convectional U burners will have a row of flames above the burner ports (holes) and these flames should be approximately 1 – 1.5 inches tall, blue with a white or yellow tip. Flames too small or too tall or too colorful imply improper carburetor setting so the adjustable air shutter at the front tip of the burner will need to be adjusted. Solaire gas BBQ grill replacement parts for all model repairs.